8 new colors of Angelina here! Every color is now on sale for $3.50 per 1/2 ounce baggie. So, I think I am going to try to make it to Stitches Midwest this year. 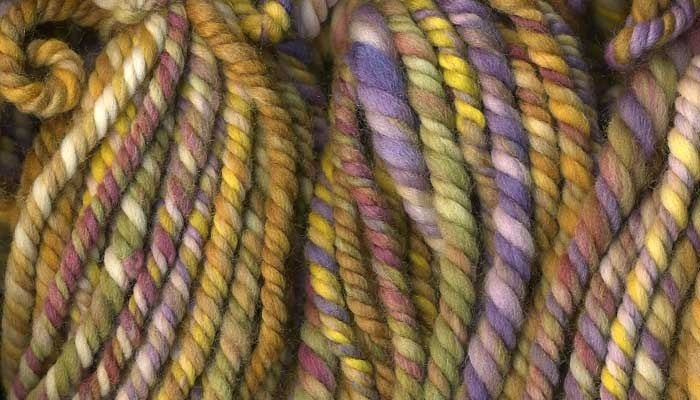 There is a frustrating lack of information about it on Knitting Universe's website, but everyone says I'm really missing out by not attending. 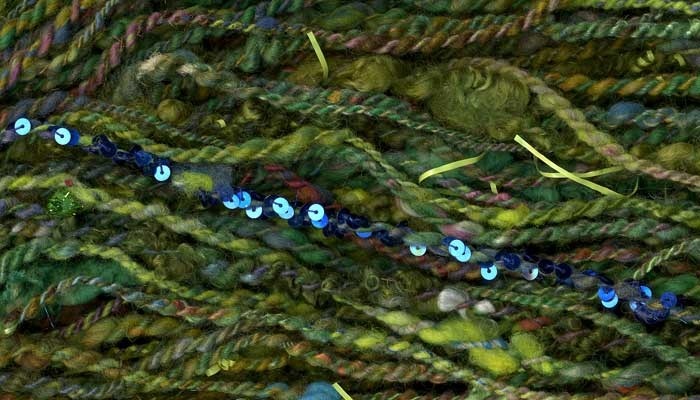 I joined all of the Stitches related groups on Ravelry so I can do as much research as possible before committing to a non-refundable credit card deposit on a hotel room. I wish they would have "Stitches Greater Northwest Houston Area" so I wouldn't have to go so far away. I must have been on crack the day I died these, because they were UG!LY! But somehow when I combined them, they looked perfect together. It's like magic. It was torture to spin them all so thinly and evenly, but I think I've really got the hang of Navajo plying. I do it differently than the lady in the YouTube video, but I came up with my own personal system quickly. There was a lot of stopping and starting of the wheel at first but I was a real navajo-machine by the end of the session. I can't make that loop stay on my wrist, but I have enough finger dexterity that I can hold the loop open with 2 fingers on the same hand that's pinching the twist while my other hand yanks the single through. A tensioned lazy kate would help a lot, because the only real problem I had was my single twisting on itself before I had a chance to stop it. I just showed the tangled skein to my husband, and he said, "It looks like you need to 'Set' the 'Twist'." He's picking up on more of my lingo, how cute. I, on the other hand, still talk about his programming stuff with words like "thingie", "thingamajig" and "you know, the thing with the thing." ^ 2-ply crazy yarn with every fiber in the world. I succeeded at navajo plying on the first try! I make my loops too small, but that can be fixed next time when I spin a significant amount of yardage (this little sampler is only a few feet long). I should have tried this a long time ago but I thought it would be more difficult. It's kind of crummy because I didn't take care to spin evenly... and I didn't choose colors I particularly like either. I was so convinced I would mess up that I didn't want to waste time or effort, now I kind of wish I had picked something pretty. Next time. Art Yarn Add-In Heaven! I got a huge batch of fun stuff yesterday and I am furiously photographing everything for the store. Sequin trim, ribbons, bead strands, big fat angelina, glow-in-the-dark cording... everything you need to make your yarn wacky. I also got a lot of cute fabric to sew little purses and project bags as giveaways. 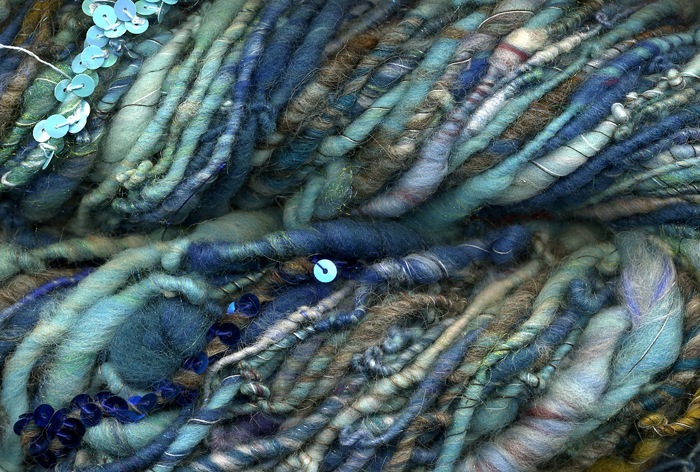 I took all the blue shaded batts out of my swap-box and this beaut' is what I came up with. It's half-corespun and half-thread wrapped.